Poker Needs A New WSOP Hero! Having witnessed the changing of the poker landscape in real time during the Moneymaker boom – a time when a young man with a name so good they had to ask for his birth certificate twice – turned a $40 satellite entry into the biggest gold-rush the poker world had ever seen. Now, as legislation and special interest groups fight to limit our access to the game, it would be a great time to find another Poker Hero to continue to drive the growth of the game and usher in a new wave of players. In my opinion, to be a poker hero in 2017 requires someone who is media savvy and willing to get in front of the camera, do interviews, shake hands etc. Someone who cared enough about the game to use their platform to help its growth for the betterment of all players. That’s why it’s important that anyone who’s passionate about the game take a shot at becoming poker’s next hero by entering the WSOP Main Event. 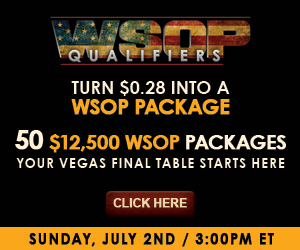 Fortunately, AmericasCardroom.eu is hosting a massive $625,000 qualifier tournament on Sunday, July 2nd at 3pm ET that is guaranteeing FIFTY $12,500 packages ($10,000 for Main Event buy-in and $2,500 for travel expenses). That’s why if you’re someone like that, take a shot at earning your way there through the Americas Cardroom qualifier. And if the $540 buy-in is too rich for your bankroll, there are tons of Step tournaments, daily satellites and MEGA satellites that’ll let you earn your seat for a fraction of the cost! Packages will also be awarded via ACR’s Jackpot Poker SNGs, as well as through their new “WSOP Buck Hunt” promotion. During the Buck Hunt, an animated chip will display randomly at cash-game tables, with the first player who manages to click on it instantly winning a free $12,500 package. Because, regardless of how you find your way into the Main Event, the important thing is for the poker community to share its diversity and the inspiring characters found within the game who will help drive the narrative of it going forward. With that said, every player most definitely has the right to forgo that responsibility and remain focused solely on the action at the table, but the more personality and (inspiration) we can share with the poker-viewing audience, the closer we can get to a new golden age of online poker. To find out more about Americas Cardroom’s WSOP Qualifier 50-Seat Guarantee and take your first step to becoming poker’s newest hero, head over to AmericasCardroom.eu today. Read all about the Americas Cardroom bonus codes here. Win your way into the WSOP at Americas Cardroom!